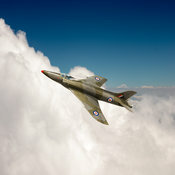 Have you ever wished you could have your relative's or friend's or your own aviation past remembered in a unique, carefully crafted piece of aviation art? The works in this gallery were all commissioned from scratch or customised for clients. The process typically involves a certain amount of research to make the pictures as historically accurate as possible, and it helps if you have at least some documentation - perhaps a diary or other written account, squadron records, or old logbooks in the loft? - and ideally contemporary photographs. I then prepare a rough 'sketch' and a number of drafts to get the composition the way you would like it before making the final piece. How much does it cost? You will appreciate that it can take probably a week or two, depending on the complexity; so have in mind a budget that allows for that - but in the order of a few hundred pounds not a few thousand. It can be very little for something relatively simple, such as one of my existing pictures with different squadron codes on, if appropriate. And of course it costs nothing just to send an enquiry.